I don’t think “lose hood over crest” was in the notes, you guys. 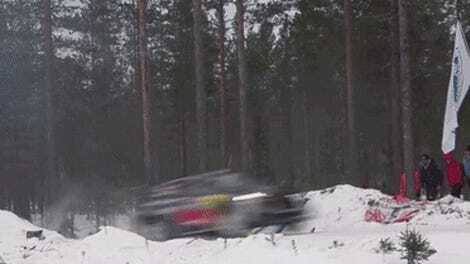 Rally Sweden has the most infamous long jump in all of rallying—Colin’s Crest—and over this past weekend, driver Louise Cook had the nightmare experience of not being able to see where she was going to land thanks to a hood failure. Cook was running in the WRC 3 class over the weekend, but rolled her Ford Fiesta on Stage 2 of the event. Nevertheless, she drove on, only to have her mended front end fail spectacularly later during the rally. The hood came loose while airborne after Colin’s Crest, sending her light pod flapping in the wind and blocking the front windshield of the car. Cook also lost her bumper before Colin’s Crest, and as with Mads Østberg’s lost wing, a fan found it and returned it to her. Sweden has the best fans, man.